I met Frank back in 2012 and found out about him by way of referral from my brother. I e-mailed Frank many questions about how he would do his work, the light output, the power consumption, how he would run wires and etc. Frank answered every single question and based on that I set up an appointment. Frank showed up at the agreed upon time with his partner and some other workers all of whom were polite. He showed me examples of the lights I could install by illuminating the physical pot light. By the end of the day my home had completely transformed into a completely different home. Frank also went out of his way to help me out at no charge with other light fixtures, a range hood and a mirror. Fast forward to the this year. I moved into our new home and based on Frank's past work I e-mailed him again. Once again Frank arrived a few days before the job to give me an estimate on exterior and interior potlights. Frank gave me a great price based on my past work and the amount of work I also had on this job. Frank arrived later that week with his crew complete with all the tools required including scaffolding for the part of my home that goes up 12 to 15 feet. Frank did such good work two other neighbours in my neighbourhood came out and got Frank to do some work for them on the same day. The after-sales service that you get from Frank is unrivaled and cannot be found anywhere else in his industry. In my first house the lights frank installed in 2012 are still running according to the new owners I sold the home to. That's over 5 years of quality. Frank is someone you can trust to pick up his phone when you have an issue or when you have more needs. I met Barry about five years ago when I had just gotten married and was on a strict budget with our new home. We wanted something more visually appealing than the standard door we had and Barry arranged to meet with us, show us all our options and more importantly worked with our budget. Over the five years we resided at this house we got compliments of the door each and every time people visited us. Fast Forward to this year. We have moved into a new home with our new baby and I suddenly wake up that morning realizing I want a door insert for our door. I sent Barry a message around 7 a.m. on a Saturday morning and receive a response within 10-15 minutes. Barry arranged to meet me that same evening and once again within the hour I had a new door again letting in plenty of light. Would highly recommend whatapane. Barry and his colleague are professional and efficient. We are one of the longest running companies operating in our field of work (©1998), and it is refreshing when we manage to see our previous clients again. We are very glad that you liked our work and took time to post this review. Good luck in your new home and call us if you ever need any further help with any glass projects. From the moment the call was made to the sales rep to the install they ensured that the job was done right. We were very happy with their GSM system as well as the door contacts installed in the basement and main floor. We walked into the store expecting to simply provide our window measurements to the sales rep and walk out with simple faux wood Levlor Blinds. The sales rep advised us that our windows would be more than likely a custom order and very patiently explained Home Depot's service in which someone would come into your house and visit your home to take measurements and show you a huge selection of window treatments. After all was said and done we picked a few window treatments and had Home Depot Install it for us. Dan is filled with a wealth of information when it came to helping us select the best option for our new home. He also took the time to explain the benefits of the Eco Shades that he suggested. It has been about a month or so and sometimes I can't tell whether the air conditioning is on or off in my main floor and to my surprise on several occasions I've returned home from work only to walk in to my living room feeling like I don't have to reach for the thermostat to adjust the AC because the room is already cool. The best part about the shades Dan installed is that they let you see outside but still give you the privacy since the same shades don't allow you to see inside. The actual look and feel of the shades is very sleek and clean. Dan did not leave until the job completed and we were completely satisfied. 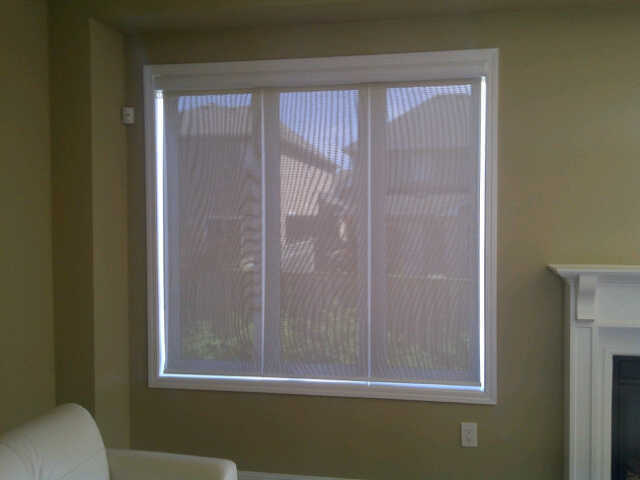 If you want to make a decision that will save you money in energy costs (including in the winter) I would not hesitate to suggest EcoShades for the job. Barry made things really easy. From the moment I called him he was able to meet right that weekend to take measurements of the door and bring a few samples that we had picked out from his very functional website. He came to install the door insert first as the other components were being produced (custom made) and he was in and out and even without the other components in place we couldn't help but think how much more light was flowing through the house with the full length door insert. 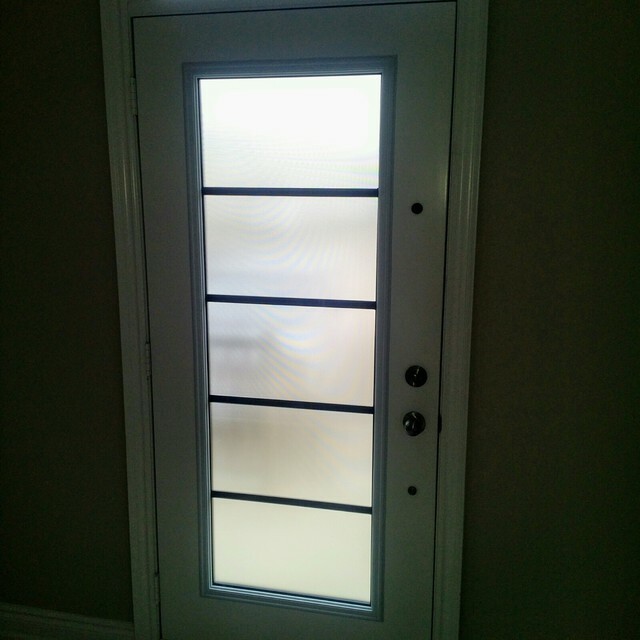 They came a few weeks later with the components (transom and side inserts) and again in and out with minimal disruption and they left no mess behind. Barry is easy to get a hold off and responds to e-mails very quickly. I can assure you that if you're considering What A Pane for your next job you will be very happy that you did! It was also a pleasure dealing with you and your wife. 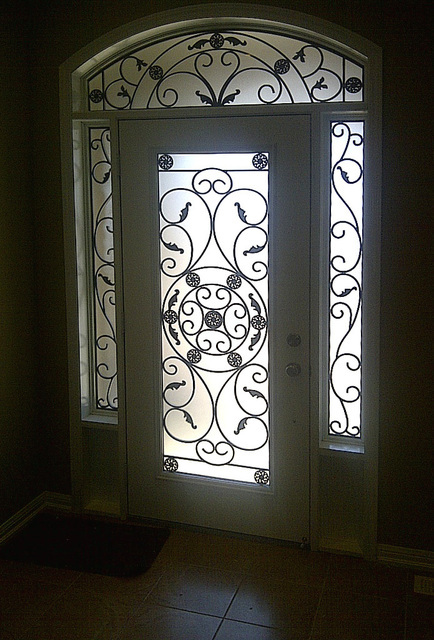 Your entranceway, in my opinion, is one of the best on your street!. Not only for your choice of our "Destiny" design but the symmetry that was created by your input, was superb.